Vanya Simeonova has been involved in the Fitness industry since 2011. Beginning as a certified group class instructor it was then she realized how much she loved working with and helping people achieve their fitness and health goals. Vanya then went on to gain a certificate in Fitness and Business level 3 & 4 in 2012 and has been a personal trainer ever since. Vanya has worked in a variety of Fitness Centers and on a Cruise ship as a PT and fitness instructor. Throughout the years she has had a wide range of clients, from athletes and performers to elderly, mums, pregnant women, teenagers, overweight, underweight, medically, physically and mentally challenged, men and women. Vanya strongly believes in the power of one’s mind and she incorporates this into her work with every client she has the honour of working with. Vanya also has qualifications in sports and children’s nutrition. Vanya loves to work as a personal trainer in the field of Lifestyle Coaching and she absolutely loves it! Incorporating this style of coaching along with the Fitness Coaching has proven to deliver some incredible results to her clients. Vanya loves a challenge and loves working with individuals who despite their efforts hadn’t had much success in achieving their goals in the past. Vanya has received her own coaching from Johanna since 2017. In this time Vanya became a champion herself (see her testimonial) and has mastered the effectiveness of Johanna’s training systems. 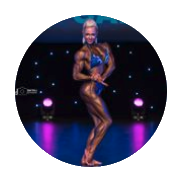 This, along with Vanya’s passion for coaching, her fitness industry experience and her ability to really care, is the reason why Vanya is the Assistant Coach for Johanna’s Female Bodybuilding Team.